Man Utd (0) : - . Everton (1) : Bryan Oviedo[86']. De Gea; Rafael, Smalling, Vidic, Evra; Fellaini, Giggs; Valencia, Kagawa, Welbeck. Substitutes : Lindegaard; Evans, Chicharito, Nani, Young, Cleverley, Januzaj. Howard; Coleman, Jagielka, Distin, Oviedo; Barry, McCarthy; Mirallas, Barkley, Pienaar; Lukaku. Substitutes : Robles; Heitinga, Jelavic, Deulofeu, Naismith, Osman, Stones. Assistants: S. Burt and H Lennard. 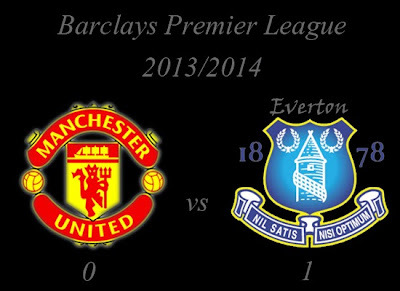 How do you think about Barclays Premier League : Manchester United vs Everton?